I don’t disagree that the business leaders’ letter was newsworthy. But if news is defined as the unexpected, this was right up there with ‘the Pope’s a Catholic’. I’m an open-minded voter. I have blogged my doubts about Ed Miliband. I was even more critical of Gordon Brown, and welcomed the coalition in May 2010. But I do object to media outlets acting as useful idiots for one political party. I was equally annoyed when the Guardian ran a feature telling people to vote against Boris Johnson in the 2008 London mayoral election. As I complained to the Guardian’s readers’ editor in response, I take huge exception to newspapers telling me how to vote. Thank goodness for the BBC and other broadcasters, who have a duty to be impartial. 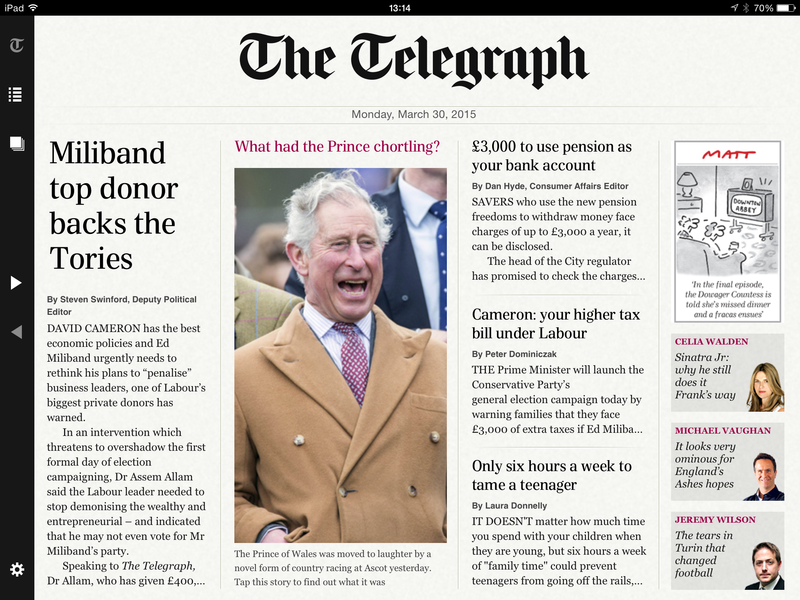 Here are the other Telegraph front pages, in case you’re pining for propaganda. This entry was posted in Politics, Politics & current affairs and tagged #GE2015, Daily Telegraph, Matt Warman by Rob Skinner. Bookmark the permalink. It’s the HSBC scandal all over again. Plus Peter – takes no prisoners – Brookes. Trevor – agree. 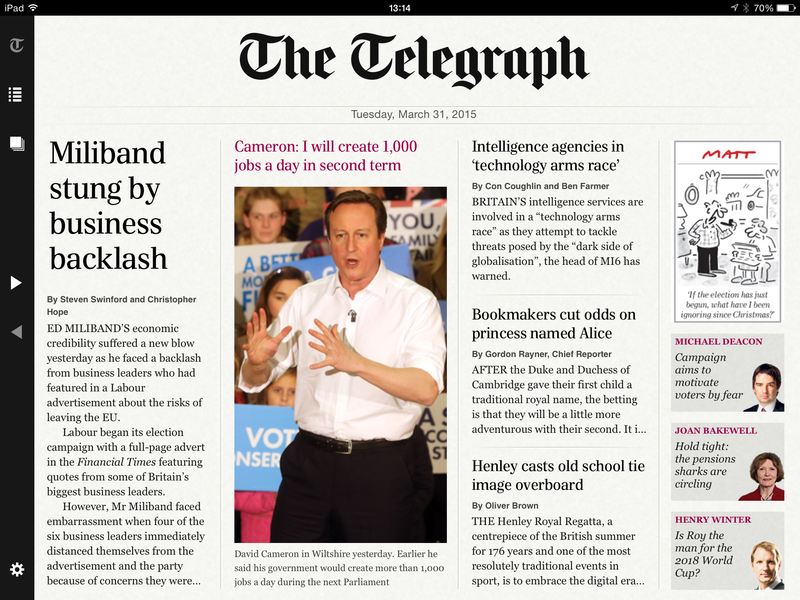 NB, I get the Times and Guardian/Observer via apps. You may as well steer clear of all “newspapers” between now and 7 May as all are showing their true colours. Also, is ‘news’ defined as something unexpected? Or is it defined as something ‘new’? The prominence given by every organ to something new is skewed by the political affiliations of every editor/owner. Ah well, back to Private Eye. Some are more biased than others, Jeremy! Disagree. Some are very obvious about their bias. Others are equally biased, just less obvious about it. Is one of these being more honest and the other more dangerous with readers absorbing propaganda from a supposedly neutral publication? 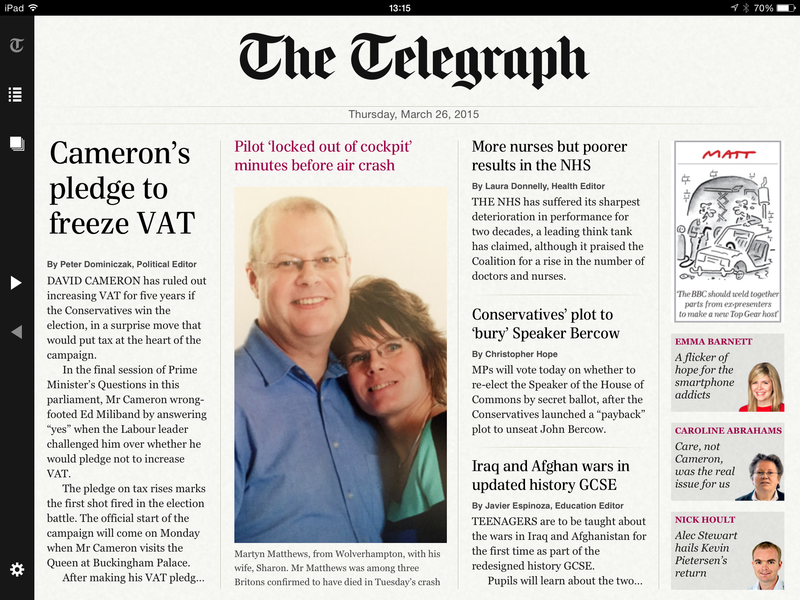 Steer clear of newspapers until the election! ‘Twas ever thus. One of the joys of the British press (and there are getting fewer and fewer of them) is that there is a spectrum of views – you pays your money and you takes your choice (or you makes your choice and then pays your money). I am a political beast – I lap up political debate, I get people very cross by lecturing them on their duty to vote (to a certain extent I don’t care who people vote for as long as they vote). BUT I fear that the constant election coverage may be counter-productive already as people get fed up with the posturing, platitudes and promises. I know, Bev, and as you would have guessed I wasn’t surprised that the Telegraph reverted to type. I was equally disgusted by the Mail in the 1983 election and the Express in 1992 for utter propaganda. I agree that it is all counter-productive. There is a very good piece in the’ I today which I’m keeping for you. Just as bad as the Telegraph – not surprising – is today’s Daily Mail with its front page lead, Red Ed ‘s rift with business grows (or something like that). I’d be ashamed to write that, wouldn’t you? Why bother to try to train journalists? Work on the cloakroom finished – very good, too.